In the first part of the Loop review, we looked at the setup process. In this, we are going to take a test drive of the app. The bell menu at the top right has your transaction notifications. Over the course of a week, I used Loop as my primary bank, sending money and making card payments. I linked it to Taxify and made it my primary card. Loop’s effectively an account at CBA, and can receive cash like a normal account. You can send money to a mobile phone via Loop ( @ KES 33), Pesalink (@KES 44) and Mobile (@KES 69) and to bank via Loop, Pesalink , EFT and RTGS (both at KES60). One of the best of the features of Loop’s send money service is the fact that it asks you to classify a transaction into what expense/investment category it falls into, and whether it is a regular payment. The app pulls your balance due from the service provider and limits your amount to what you have in the account, preventing “Insufficient Funds” notifications after the transaction is done, which is pretty neat. Loop Invest is essentially a fixed deposit account, offering 7.50% for 3 months, 8.00% for six, 8.50% for nine and 9.00% for 12 months. I assume these are annual rates. The “Break Option” takes out 0.50% points from each rate. I liked the debit orders set-up on Loop; it offers the same options as sending money meaning I can making a standing order to be paid via Loop, Pesalink, MPesa, Airtel Money or via regular bank to bank transfers eg EFT. The range is from KES 10 to KES 1,000,000,000 (One billion), though I am not sure what sort of person CBA is targeting at this stage. If I were doing 1B in standing orders, it would not really be off a mobile app. Then again, maybe this is what they mean by unbank yourself. The app also offers a frequency of payment of weekly, monthly, quarterly and annually, with a notification sent you 3 days before the payment is sent. (Major win), and like all payments off the app, it requires you to classify where the payment falls into the expense/investment categories provided. 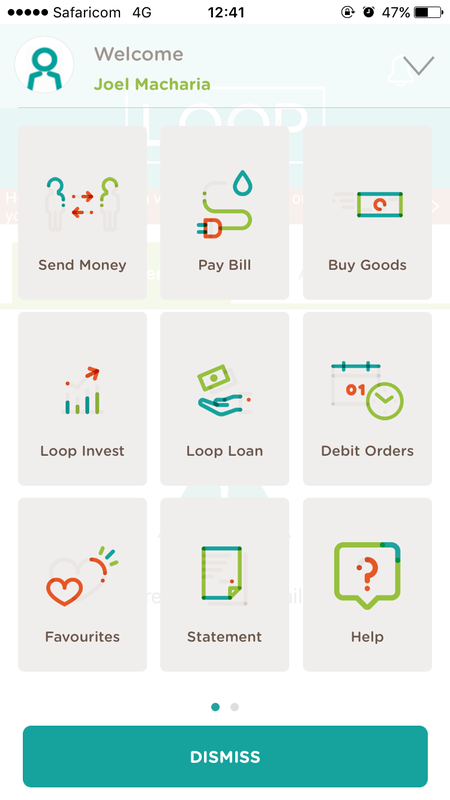 Loop really comes into its own as a personal financial management app. I’ll wager the only truly integrated one in Kenya. It was able to automatically sort my payments at Java and Urban Eatery into the Dining Category, and the Taxify payments into Transport. Weirdly, it couldn’t classify the payment I made for the Loop Card. The ability to go into your transactions and classify them after the fact is also pretty appealing. This feature alone, for me, is the killer functionality. At the moment, the only way to get expense classification is doing it manually or using SMS Sync that reads bank transaction alerts off your phone and adds them to another app (we use this for transaction tracking at Abacus). The budgeting and goal setting tools are also pretty useful in tracking how well you are able to manage your money, and whether you are making good progress towards your financial targets. I was enjoying my experience with Loop, until I tried making a Nairobi Water bill payment of 631, but the app wouldn’t let me enter anything more than 80 bob in the amount field. My “Safe to Spend” was showing KES 1,640 so I reckoned it was a bug, made the payment via another bank, and forgot about it. A couple of hours later, I tried running my card but it was declined for insufficient funds. When I checked my Safe to Spend, it was showing that I had 4X the amount I was trying to pay. Checking my accounts tab also showed I had 1, 600+ bob left in the account. It turns out that, while the transactions show on the activity side, they do not reflect on the safe to spend, nor on all transactions page – the two most logical places one would check. It was only when I went to generate a statement that I saw my balance and it clicked that 1,500+ of transactions that day had yet to reflect on the home page. Loop is a fantastic personal finance app, especially for folks that struggle to track their expenses and budgets. The set up is pretty long, but now I am set up, I expect to use it quite a bit as my personal account. Add my account details in the app (bank & branch codes) so when I am making transfers into it, I don’t have to go back to my emails for the details. Add the analysis and budgets performance to my monthly statement. Update the “Safe to Spend” real-time. It’s not really worth being there if it only displays yesterday’s numbers. Get rid of the first two screens that one has to click thru after launching the app. They don’t serve any purpose and are actually quite annoying once set-up and registration is complete.